I’m realizing that since it’s gotten warmer around these parts, I’ve been prone to make a lot of crushed ice recipes. Apologies if you do not own an ice crusher and have had to resort to a bag and rolling pin method. Unless that’s your de-stress time which concludes with a cocktail. Actually, that doesn’t sound half bad. Before we get to today’s drink, I just wanted to let you guys know that I’ve been hopping all over the internet this week invading other people’s websites, like I sometimes do. Please check out the links for some drink recipes not found on this site! Especially tasty for summer! Cherries are just blowing up right now at the farmer’s market, so I keep using them. And also apparently crushed ice. But what I’m seriously, stupidly, into right now is spices. That might sound weird, so let me explain. In the same way that I will read cocktail books and make lists of all the ingredients I don’t have so that I can purchase at some point in time, I tend to read cookbooks and do the same with ingredients I’m unfamiliar with. After getting the Jerusalem Cookbook I started making lists of spices that I’d never heard of, or had seen before and hadn’t a clue as to what I should do with them. So now I have packs of za’atar, urfa pepper, ras el hanout and sumac crowding the shelves with 3 different kinds of cinnamon, pounds of multicolored peppercorns, and so much star anise I’m considering turning it into a wreath for Christmas this year (I’m never going to use it all). Clearly, I like to hoard spices (at least it’s not cats). So I decided to use one of these unique spices to come up with a drink for the Serious Eats team: sumac. Sumac is awesome by the way. It has so much going on that it’s a pretty versatile spice to have on hand. Both sweet and savory, a little bitter, a bit more sour… it really can be used in place of lemon in a lot of dishes. 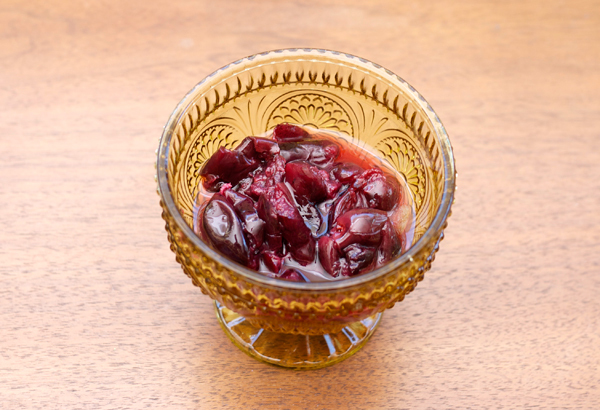 But, since we’re talking cocktails here, I decided that those sweet summer cherries could use a little sourness to them. That and tons of ice. Swizzles are serious drinks with a not so serious name. They can pack a punch on the booze side, and should be treated as a sipper, not a big gulp. Also, they require special tools. To make a proper swizzle one must use a swizzle stick that comes from the swizzlestick tree. Seriously, that’s its name. You can get by with a bar spoon too, so don’t feel like you need to go buy any special equipment. Although, if you’re already planning on doing that, I’ve picked out a couple things at the end of this post. Now, some of you are probably properly trained in the ingredients of a swizzle, so allow me some liberties here as I tell you I left out the traditional lime juice so that the tartness from the sumac shines through. There’s some falernum added to justify that though too. 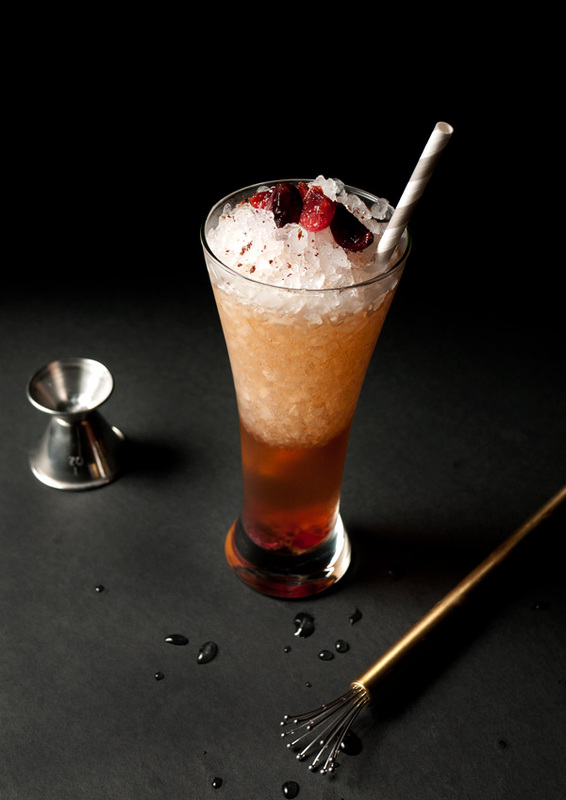 For the cocktail: In the bottom of a highball or pilsner glass, add rum, cherry-sumac syrup, and falernum, and fill glass with crushed ice. Throw in a couple of those reserved cherries left over from the syrup too. Using a swizzle stick or bar spoon, rapidly spin back and forth between your hands while also moving it up and down. Add more ice to fill the glass. Garnish with a sprinkle of sumac and several of the reserved cherry quarters from the syrup. First, this is a pretty satisfying drink. 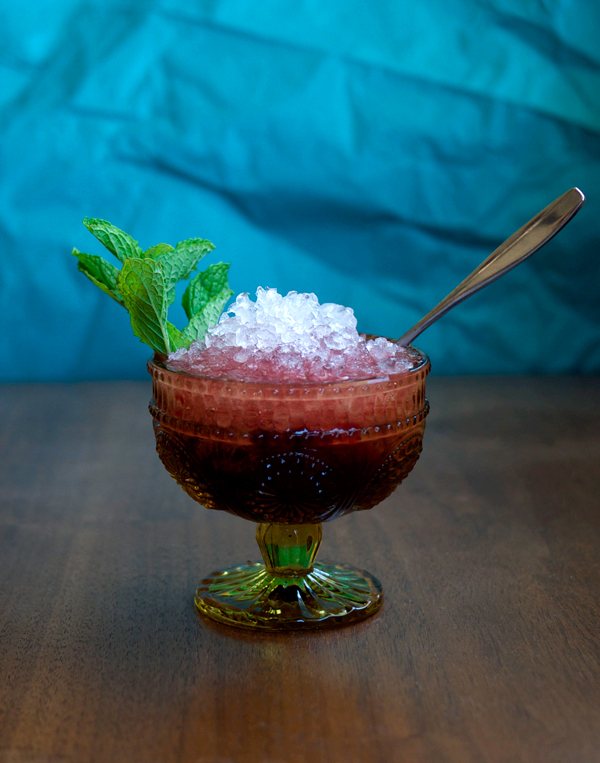 The tangy sumac and cherry syrup balances the heady vanilla and spice flavors of the rum and falernum. Second, it’s not super boozy, but the rum is very much present. 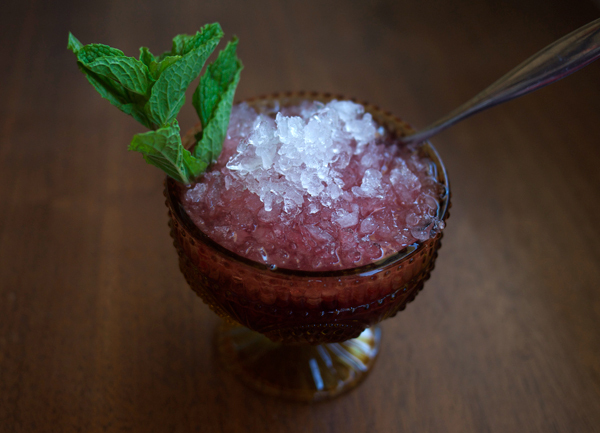 Will you be seeing more crushed ice recipes on here in the coming months? Yeah, probably, so be prepared to whack that hammer. There’s a lot going on in that title. I know. Forgive me. I’m trying to shove all the fruits I’ve been eating lately into something I can drink. And when I say eat I really mean grill. Oh yeah. I’ve been grilling fruit again. This time it was for the folks over at Serious Eats; they enjoy a good grilled fruit drink every once in awhile. One life altering aspect of this drink, besides telling people you own and have used a bottle of cachaça, is that you get to grill cherries. I’m sure you’re reading that sentence and going… and? No, but really, have you done this before? Have you experienced these awesome morsels that have somehow gotten transformed on the grill from just yum into the intoxicatingly rich, smoky, sweet bites? Do yourself a favor and grill a bunch of these, not just for the drink, and then while you’re sipping your cocktail, pop these in your mouth. By the handful. Also, I’m grilling lime wheels, which is sorta covering up the fact that I’m still finding sad, sad limes at the store. Oh! So let’s talk about the cachaça for a second. Cachaça is the national spirit of Brazil and is a very close cousin of rum. In fact, we could just call them siblings. The only major difference, if we’re generalizing here, is that cachaça does not have to be aged, unlike rum which needs to be aged to some degree. It’s distilled from fresh sugarcane, like rhum agricole and has that funky aspect in the flavor profile. 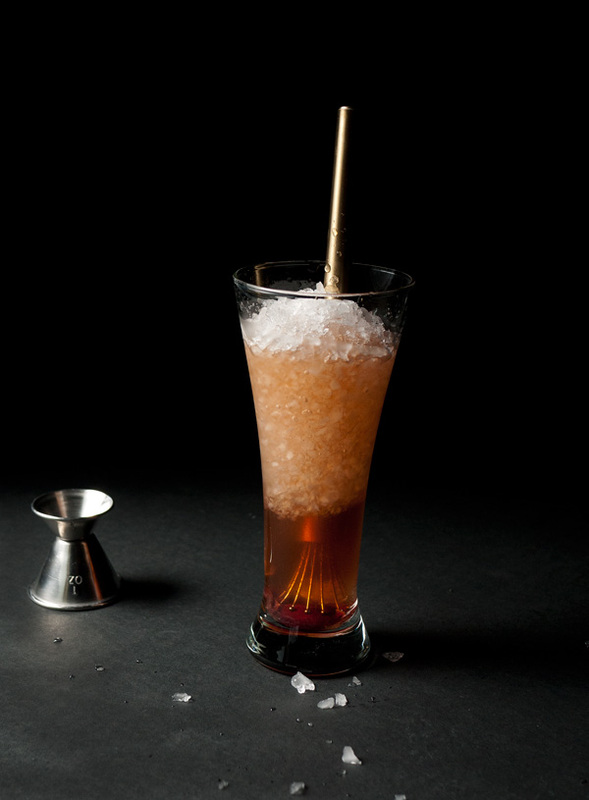 For this recipe we’re actually using aged cachaça, so if you just can’t get your hands on that, substitute a golden rum like Flor de Caña 12 Year (I tried both versions and quite frankly, am a fan of both for this drink). 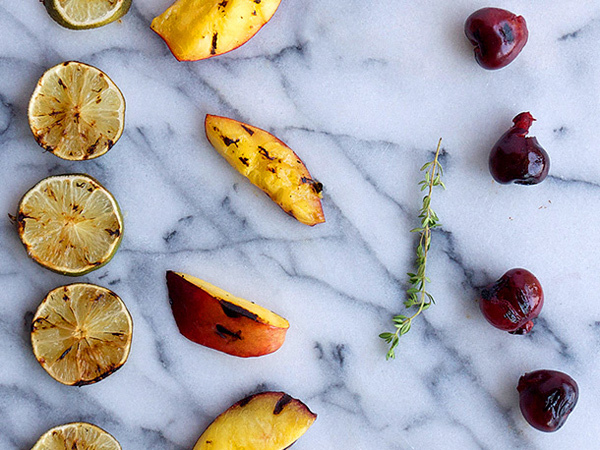 Skewer halved nectarines, lime wheels, and cherries on three skewers (with one variety of fruit per skewer) and place on a hot, oiled grill. 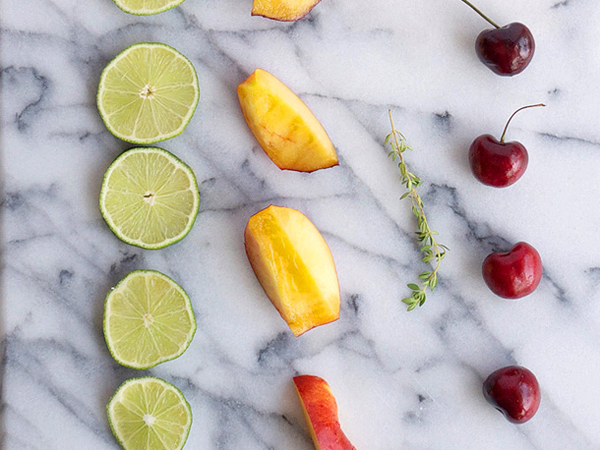 Cook until fruit begins to bubble and char lines are visible on all sides, rotating as necessary, about 4 minutes for cherries and 8 to 10 minutes total for nectarines and limes. Remove from grill and let cool for 10 minutes. Cut nectarines into quarters. 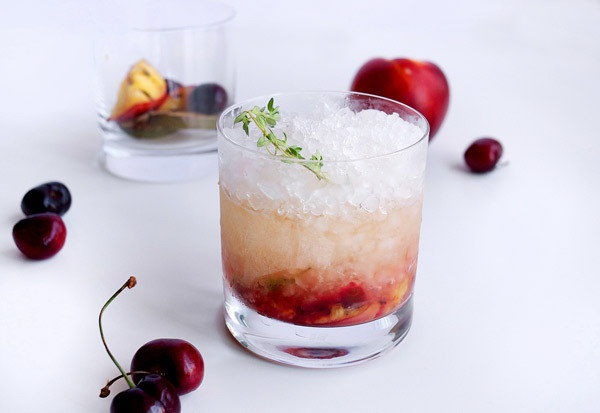 For each drink, muddle 2 cherries, 2 lime wheels, 2 nectarine quarters, one sprig thyme, and 1/4 ounce simple syrup in the bottom of a rocks glass until nectarine is broken up. Remove lime wheels from glass. Pack 1/2 cup crushed ice. Add 1 1/2 ounces cachaça and stir gently. 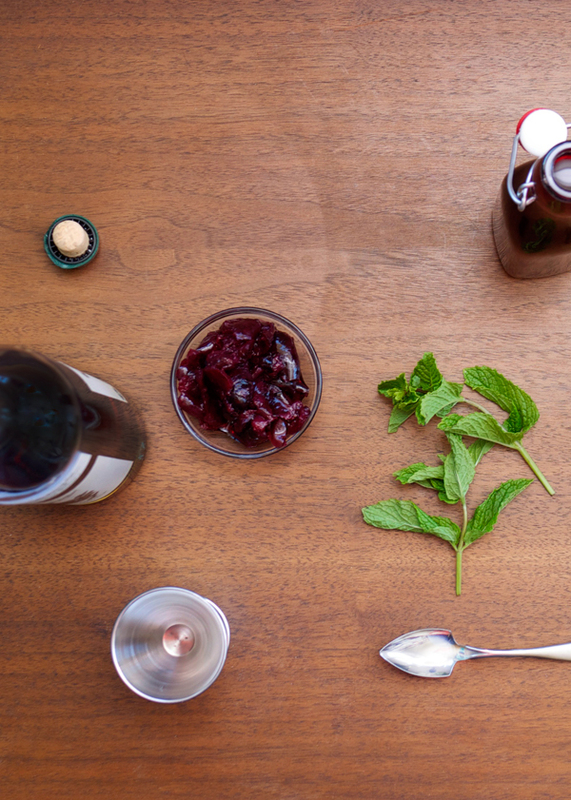 Pack 1/2 cup more crushed ice into glass and garnish with second thyme sprig. Repeat for second drink. Serve immediately. The nectarine flavor really sings in this drink, and the cherries add wonderful richness. 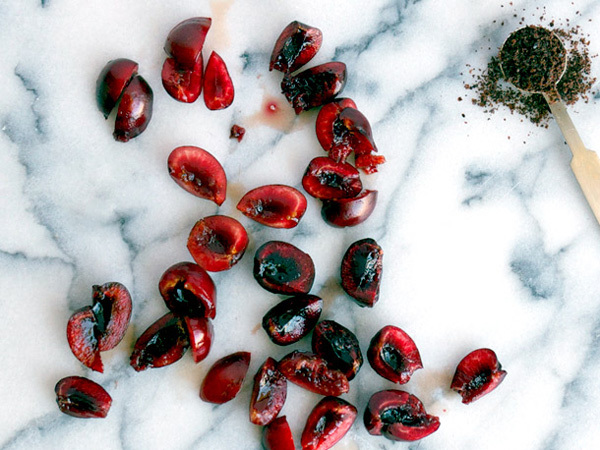 One might think these fruits would be heading you toward the overly-sweet side. But the lime, once grilled, actually takes on a slightly savory essence that only gets more earthy with the addition of lemon thyme. And one last mention here: the giveaway for the wine/ice bucket ends in just TWO DAYS! Enter now for a chance to win!